The Manor House is an intimate and exclusive venue for informal and formal functions. Only 20 miles from the centre of London, this beautiful Grade II listed Georgian House and 11 arce garden is a ‘rare corner of rural England in town’. The house can be exclusively hired for weddings, corporate events and special celebrations. The Manor House grounds are used to marquees of all designs being erected in their grounds during warm months. However they required a covered space that guests can access directly from the Manor House to give a ‘marquee experience’ during the winter season. Tailored to wooden structure being constructed by another company. The structure was designed to be viewed from the inside only, as during the winter period there are no functions in the garden. BARKERS Marquees designed, made and installed the Marquee Pergola covers, linings and aluminium channels for this structure. As the structure is on such an exposed site Michael was keen to get engineering input at an early stage to avoid disaster. This ensured that ponding and leakage has not occurred as we suggested raising the roof pitch on the wooden structure during the design stage. It has also meant that the structure has withstood gale force conditions and only needed the straps tightening. Making the Pergola Marquee rain and wind proof whilst not being able to attach to the existing building was a challenge. BARKERS Marquees used their knowledge of PVC fabrics and designed a semi-rigid solution that abuts onto the adjacent vertical wall. 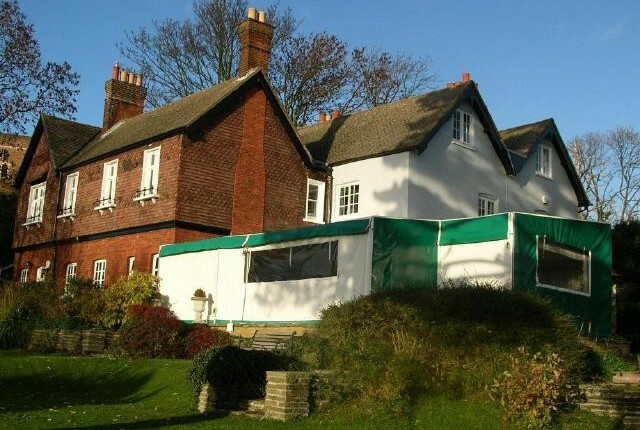 Michael was recommended to BARKERS Marquees by his existing marquee hire company. He was looking for someone who would produce a bespoke solution and had sufficient engineering and practical knowledge. ‘Most Marquee Manufacturers are only interested in selling you their standard range – so finding BARKERS Marquees was a godsend’. By adding this area to the Manor House’s winter season, the business has been able to increase their function places by 65. With an approximate 3 year payback Michael feels this is good value for money.